It's that time again! Whew! Let me tell ya'll it has been a looooong week! But....I'm counting down the days though until Spring Break which begins next Friday. Care to know how many hours too? 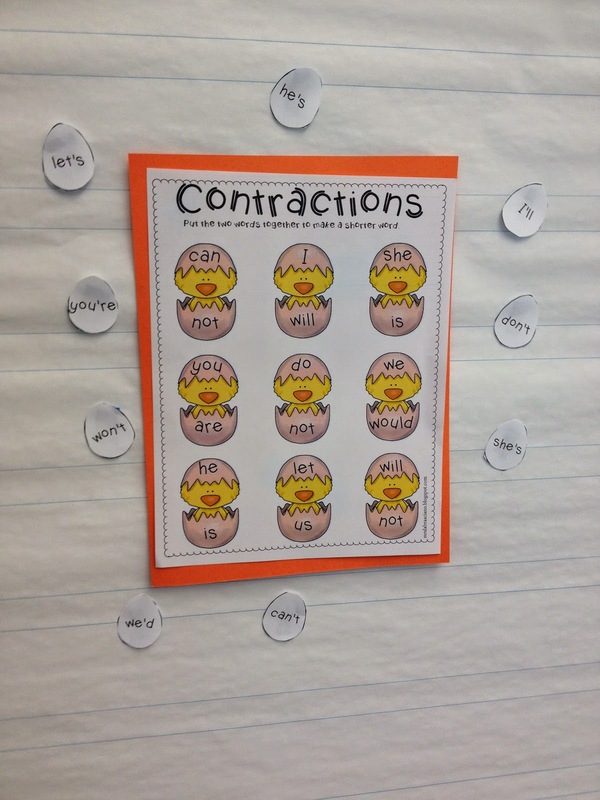 We had great fun using this center on contractions for our word work this week. 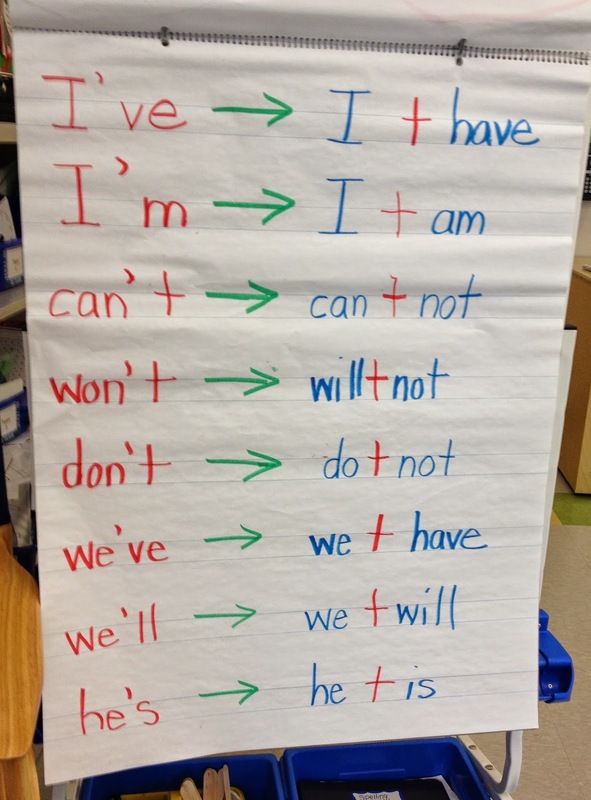 This adorableness is from Learning Lessons with Mrs. Labrasciano. Amy and I swapped products to try out in our classroom (she used my Parts of Speech sort with her class). First off, my kiddos were so excited to hear about how I was sharing materials with another first grade class. They wanted to know it all: Have we met? Is she nice? What does she look like? Too funny, I tell ya! 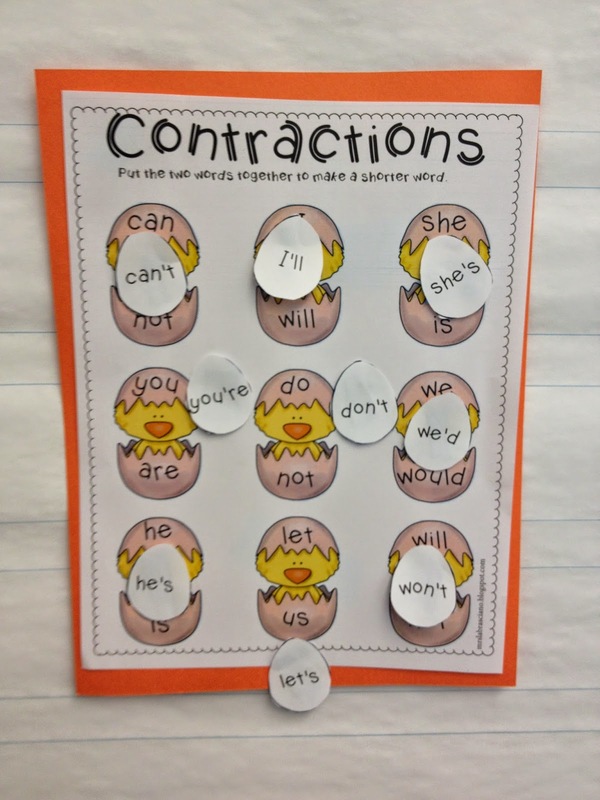 Prior to using Amy's center activity on contractions, we began by identifying contraction words in our morning message and then discussing what contractions are and how/why we used them. We then used Amy's center as a whole class lesson and then it was added to our word work bin as a choice during our Daily 5 rotations. 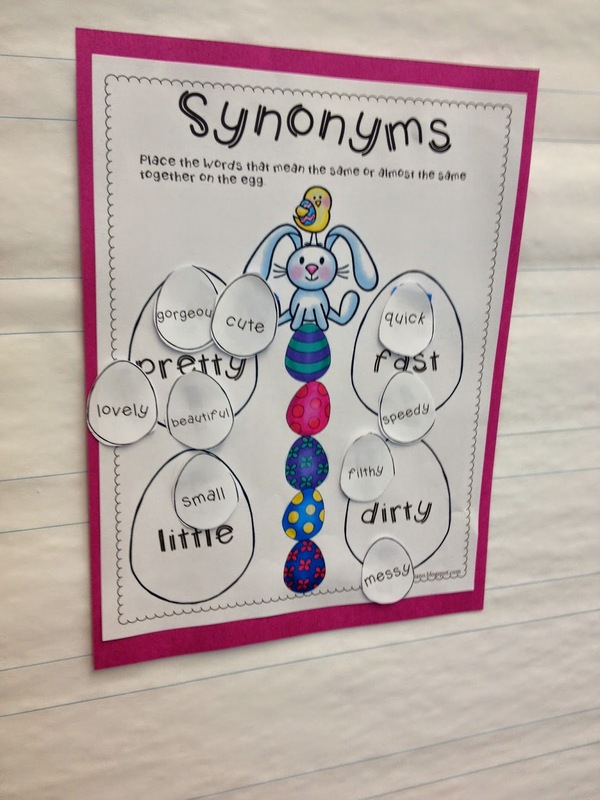 We also used used this adorable synonyms sort which also comes from Amy's Bunny ELA centers. 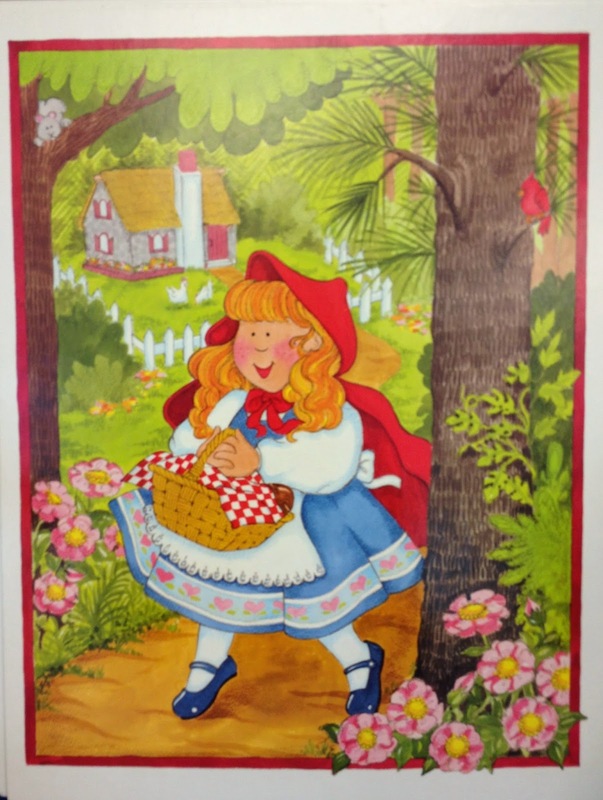 Students completed a character map to use 5 words to describe Little Red Riding Hood, tell about her problem, and the solution in the story, and how she is different at the end of the story. 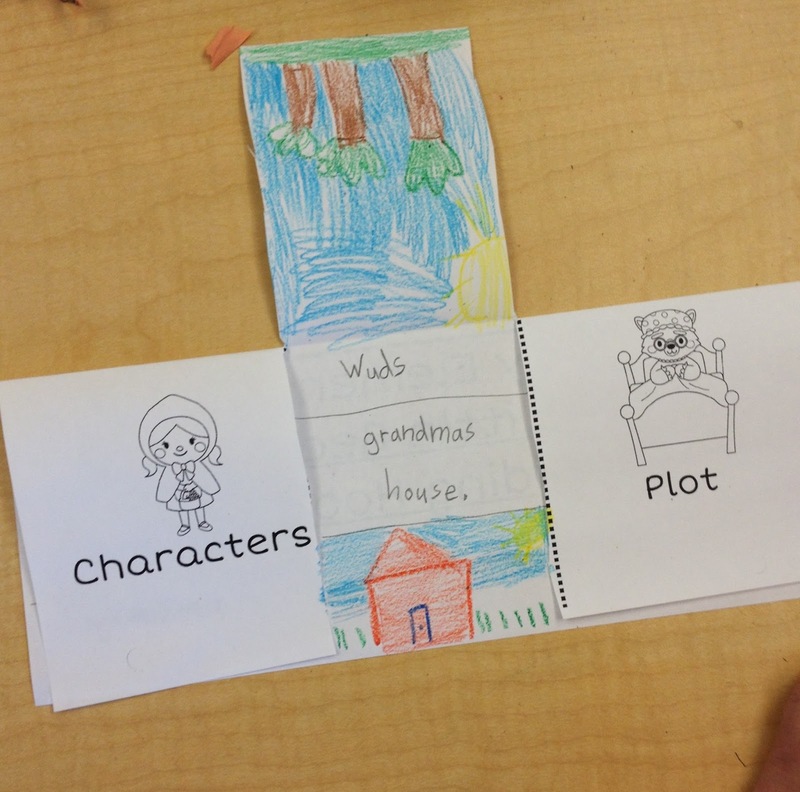 We also used a story elements lift and flap activity to show our understanding of the folktales characters, setting, and plot. 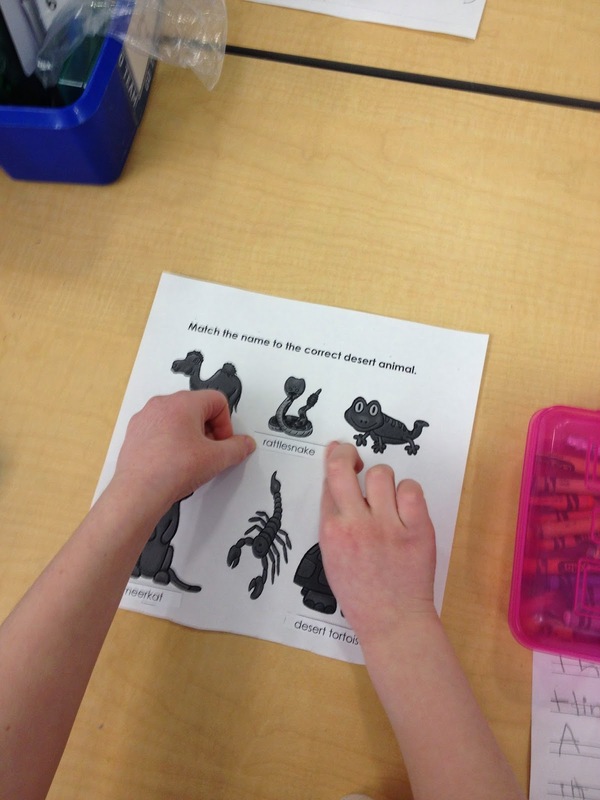 We are learning about habitats. 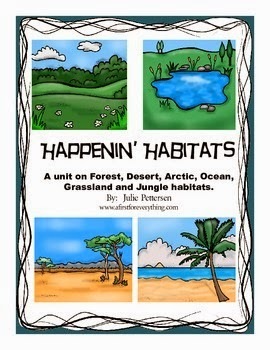 We began by using my Happenin' Habitats unit. We talked about what a habitat is. After reading my description that is included in the unit on what a desert habitat looks like and feels like, we brainstormed some words and characteristics of this habitat and completed a web. 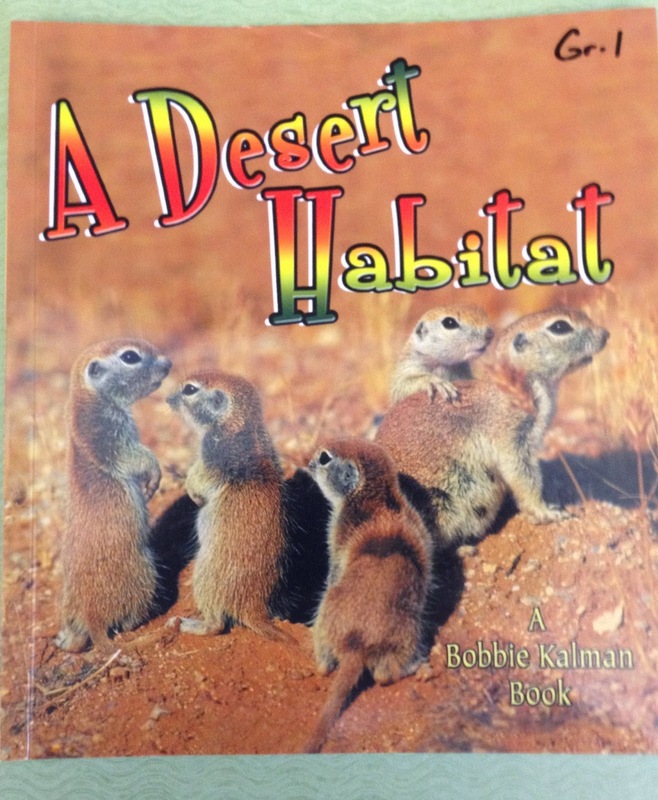 We also discussed the types of animals that live in a desert and we identified them with this animal classification activity. Monetary value and counting coins continue to be a large part of our focus in math. We played "One-Dollar Exhange" this week by using a place-value mat to count coins, trading in coins as we could, for a one dollar bill. 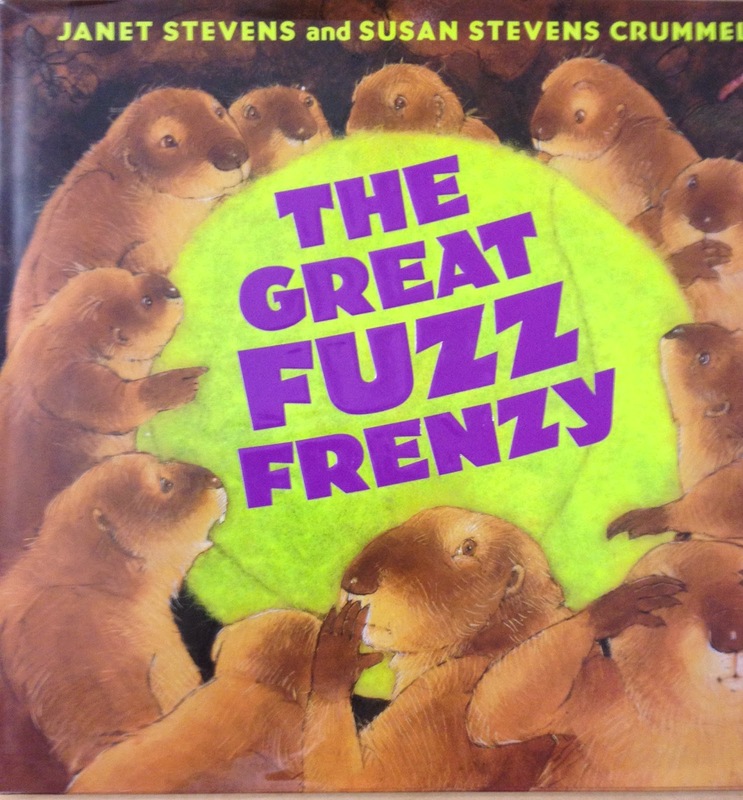 If you have never read The Great Fuzz Frenzy then run- do not walk to go get it! It is laugh out loud funny! The kiddos loved it! Actually, I don't know who enjoyed it more- them or I. 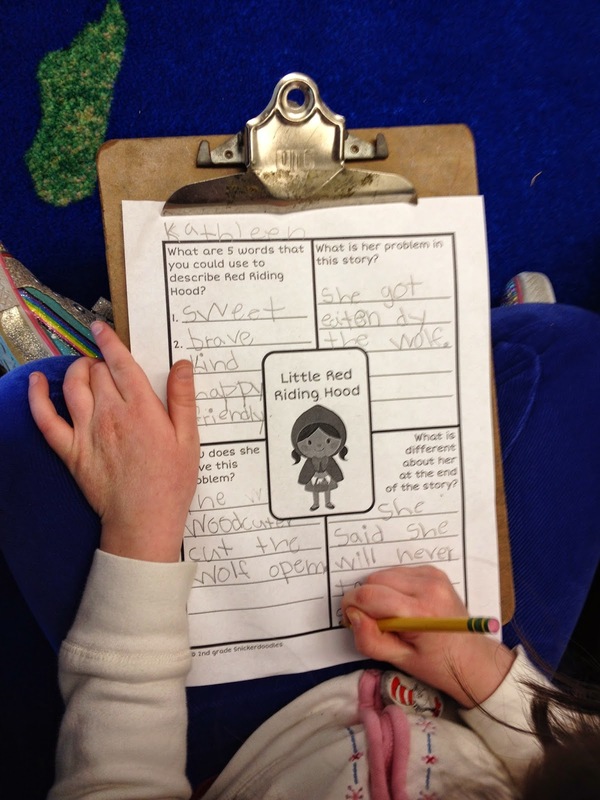 After reading the story, we wrote the story from the perspective of different character. However, you could also have your students write the ending to the story, as it does end with a bit of a cliffhanger. It was a busy week for sure and next week is promising to be even busier with parent/teacher conferences and a full day professional development day but....Spring Break is one the horizon and I am counting the days! Hoping you have had a terrific week as well. Have you blogged about it? 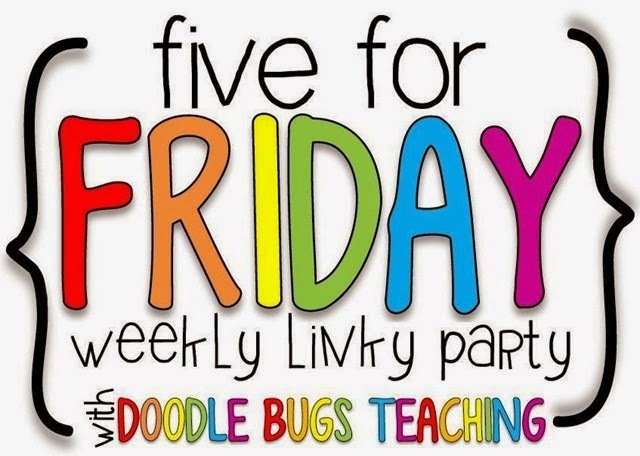 Join us at Doodle Bugs Teaching to tell us about your week! I may be partial, but I love this post! Thanks for telling me about your sweet kiddos.